How Do You Get to the Truth?? God comes to each of us in a uniquely personal way, geared to who we are, geared to the way He created us. Do you know someone who has only a elementary view of God, a person who may have a “simple” faith, but a faith that is truly genuine? On the other hand, do you know someone whose faith comes from an intellectual consideration of God? We don’t have to be an intellectual, don’t have to be the smartest person around, to be one of the most virtuous people around. But we can also be virtuous, and intellectually savy, too. Neither cancels out the other. 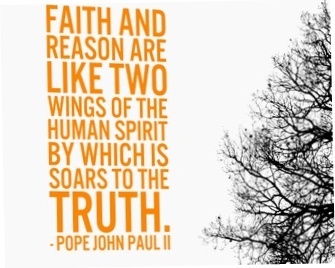 Faith and Reason are in harmony with one another. What wonderful words–by knowing and loving God, we come to know the truth about ourselves. He sees us as we are–His children. And He loves us whether we’re smart, or not so smart; whether we’re beautiful, or not so beautiful, whether we’re successful, or not so successful. He sees the light within us because He put it there. He knows its capability. He knows us. Simple Faith or Complicated Faith, we are His. It took me much too long to realize that each of us is called to live out his or her faith uniquely. I spent too much of my life putting people into boxes. I try not to do that anymore. Same here. And something else I had to learn as a mother of five– not to try to “re-create” my children, too! Well said, Debra! I so agree! How Do You Make a Dream Come True?